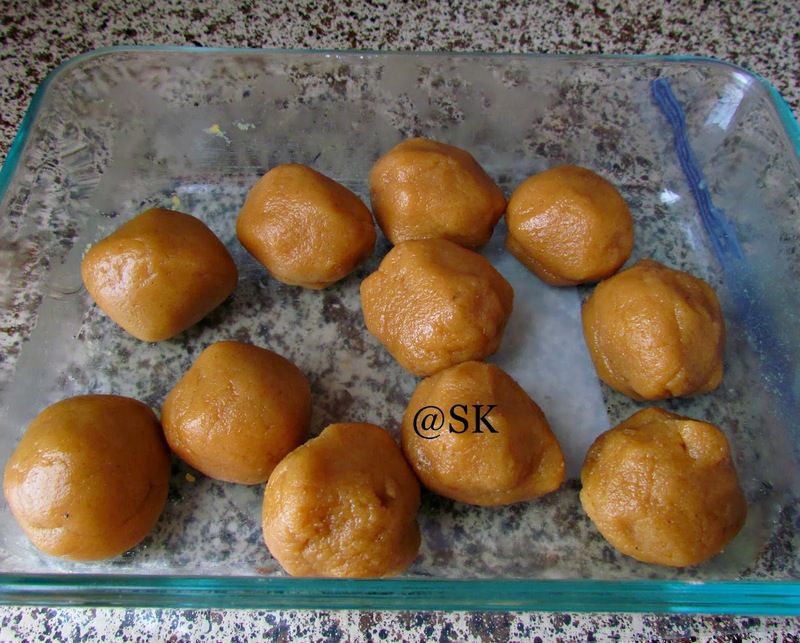 Savitha's Kitchen: Adhirasam / அதிரசம் - Easy Diwali recipes - Step by step - A detailed post about preparing adhirasam and soft ball consistancy. Adhirasam / அதிரசம் - Easy Diwali recipes - Step by step - A detailed post about preparing adhirasam and soft ball consistancy. Making adhirasam will be the dream of every Indian women . 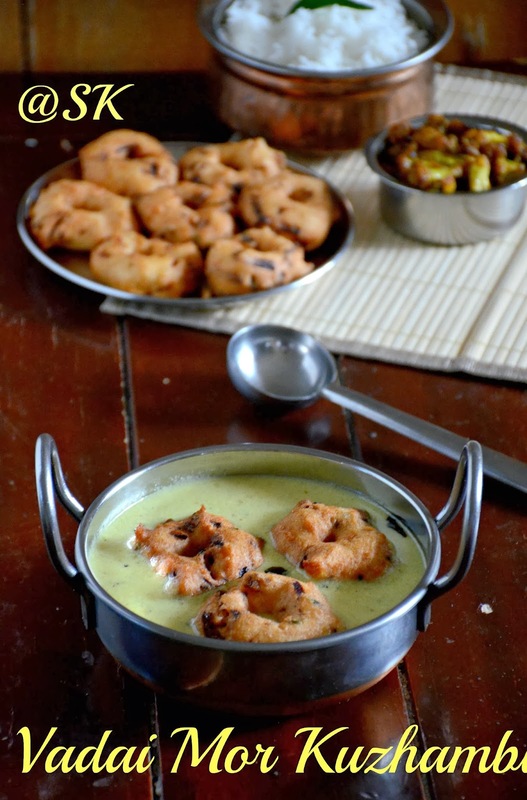 If we have mastered adhirasam, then we can claim ourselves "Cooking Queens" (Lolz). My MIL is a queen literally in making adhirasam. 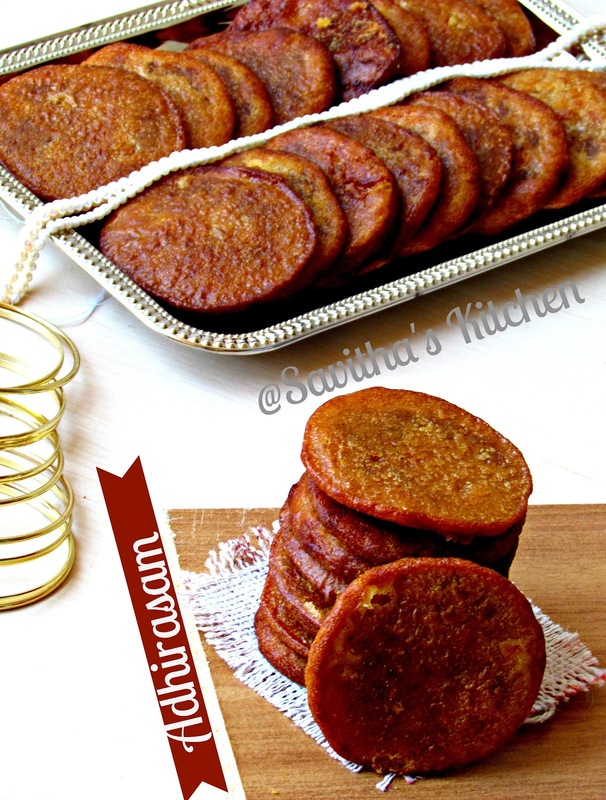 When she makes, adhirasam, all the 50 adhirasams will be in same size and it has the same taste, as I tasted it for the first time. Its her "Kai pakkuvam", which does the magic.Whenever ,she asks me ,what I want from India, I will say without hesitating ,that I need a pack of "adhirasam".I am a die hard fan of this traditional sweet. 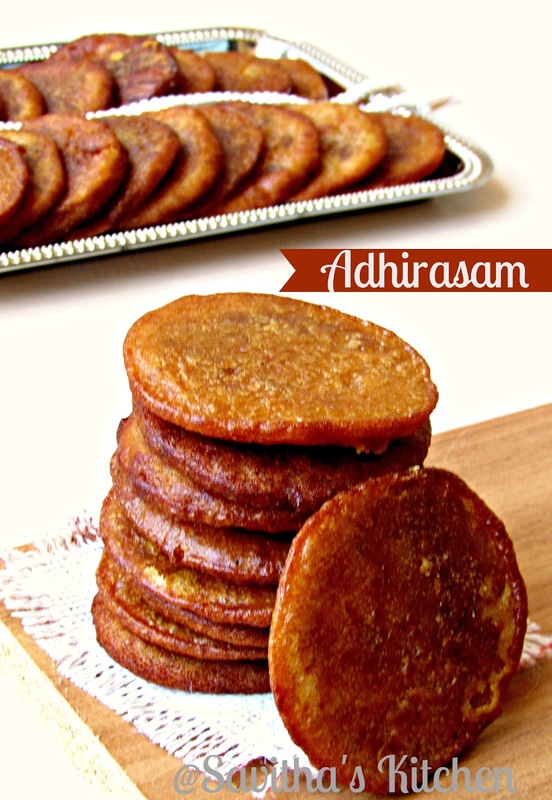 I used to prepare adhirasam using the jaggery ,which I get it from the Indian stores. It will not be that perfect. So when I went to India ,my MIL bought me these "Paagu vellam" for preparing adhirasam. 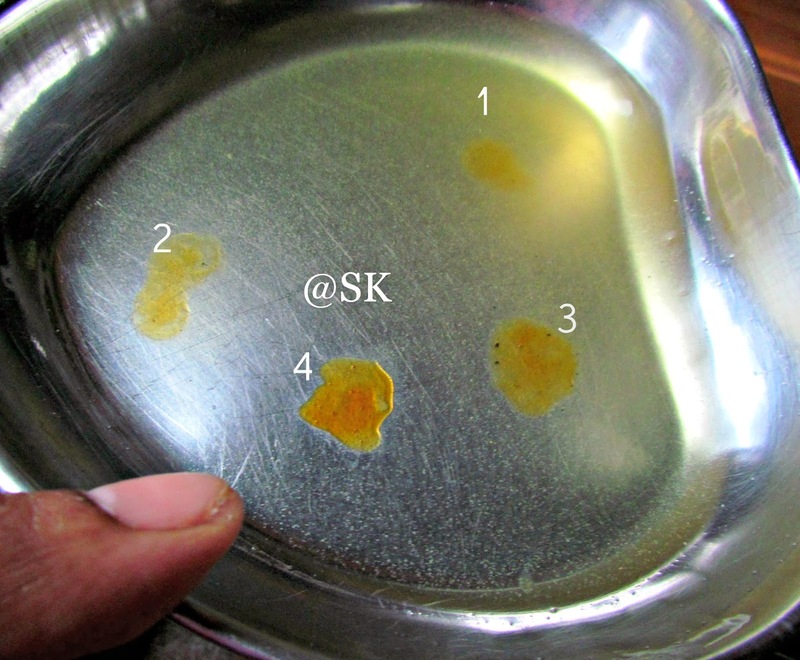 Also she gave many tips to get good ahirasam. I was waiting to make a post of adhirasam. Today I am really happy with the outcome. For a perfect two important things has to be noted. 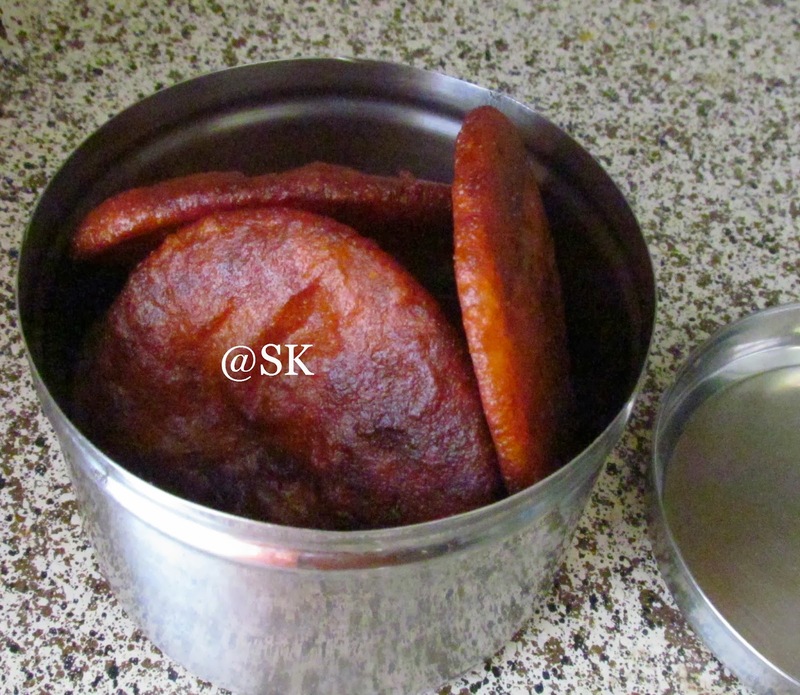 One is "paagu vellam/ jaggery and home made rice flour. 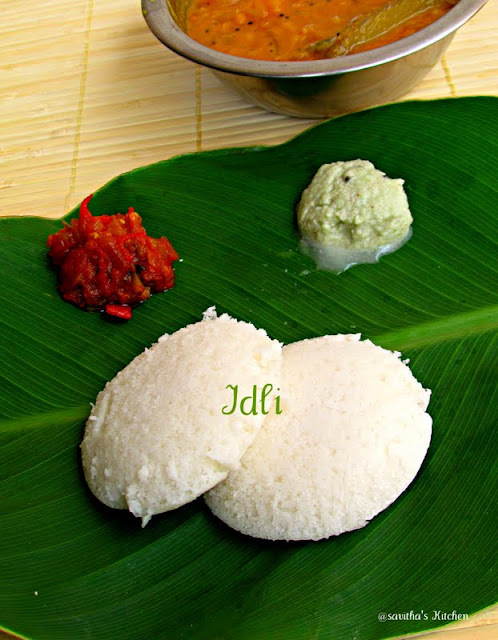 I have given the link for making rice flour at home. 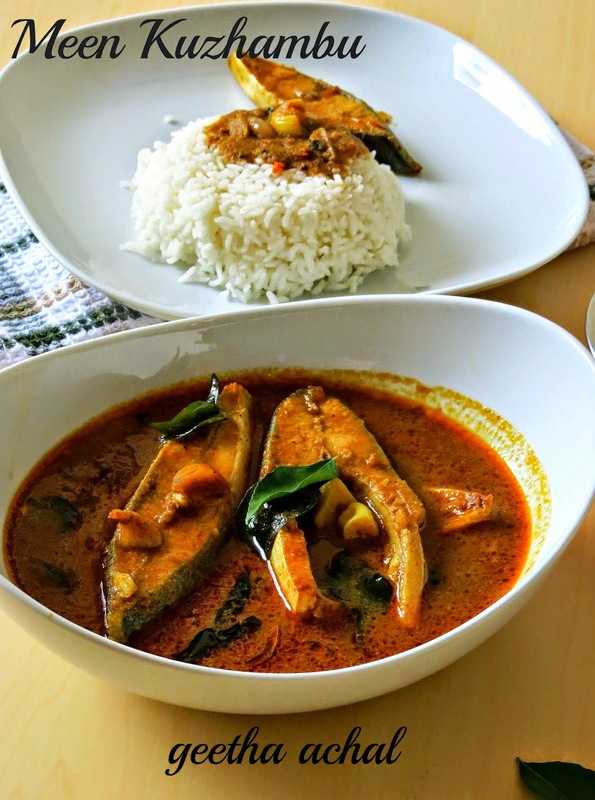 Paagu vellam has to be bought from stores. We can also get that jaggery here in US , but we have to make little research. So here is the dtailed post about "Adhirasam". Yield : 9 medium sized adhirasams. 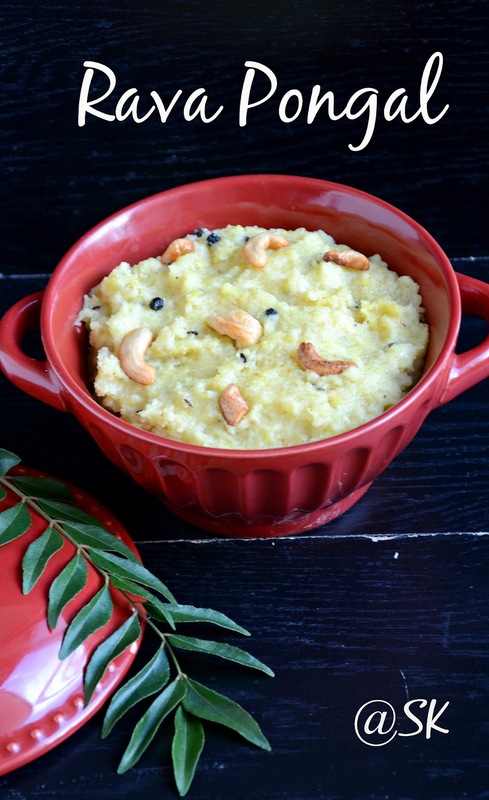 Make the rice flour at home and keep it ready . You can check the recipe for home made flour here. I took a rice cup of 160 ml for measuring my rice flour. 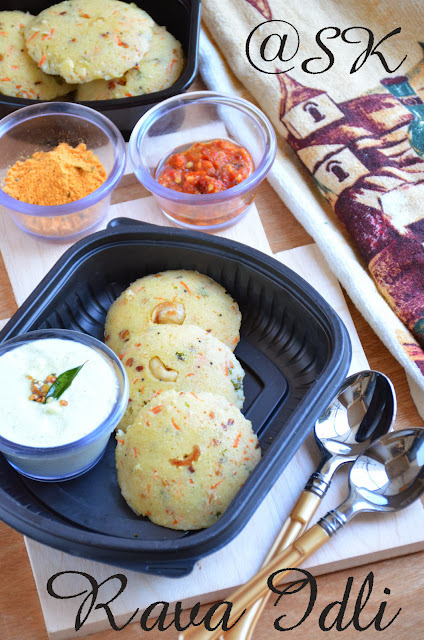 For adhirasam, the rice flour should be wet. That is ,after preparing rice flour it should be used within few hours. So we cannot prepare the rice flour the day before as it may dry soon. 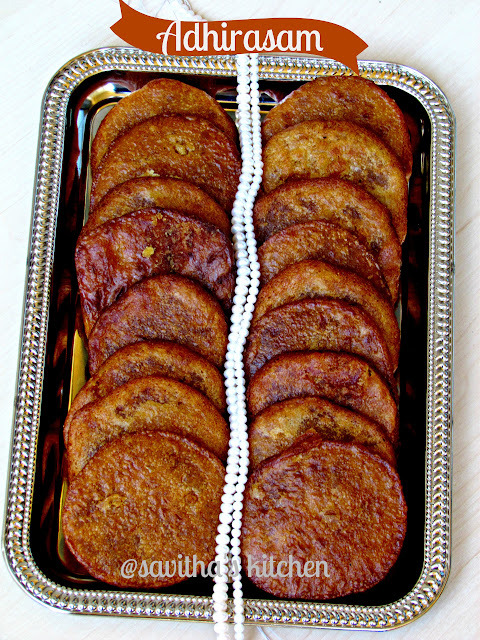 Now take the "Paagu vellam" or jaggery and use a serated knife and grate it. 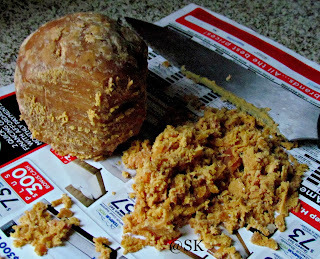 This is the easiest method to grate jaggery. 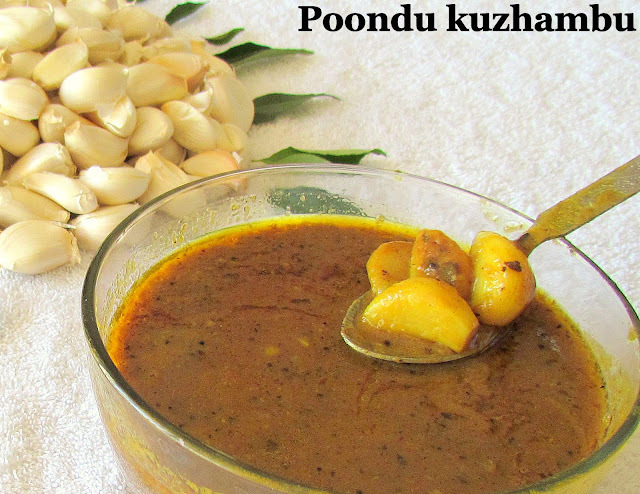 Paagu vellam is very essential in preparing syrup for adhirasam. Take a heavy bottomed pan. I took my pressure pan, which has heavy bottom. Place the jaggery in the pan. Pour little water,so that the jiggery is just covered. Don't add more water, then the soft ball consistency will reached so late. 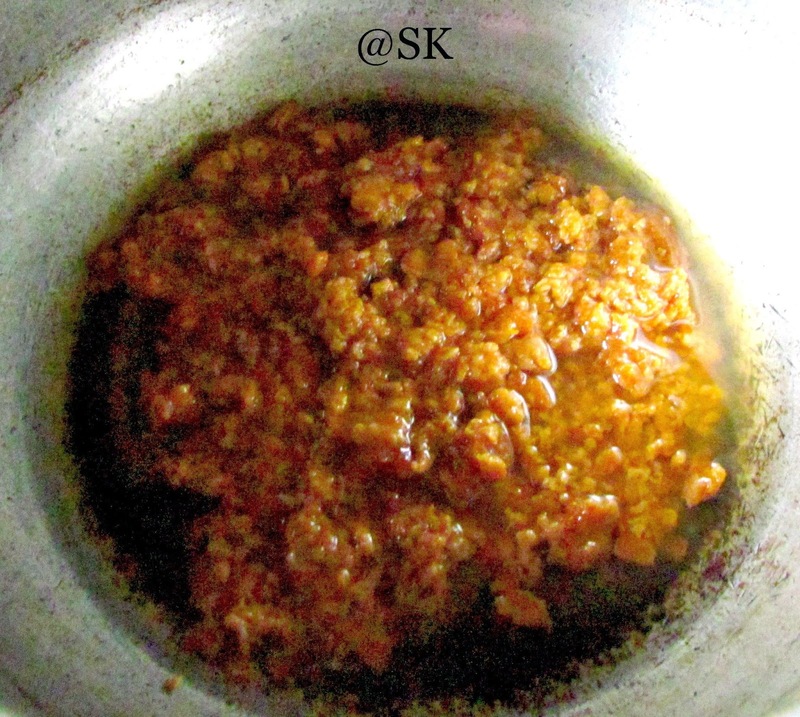 Heat the jaggery in medium flame ,until the jaggery is dissolved. Now turn off the stove. Strain it using a steel filter. As you see, the impurities are removed after filtering. 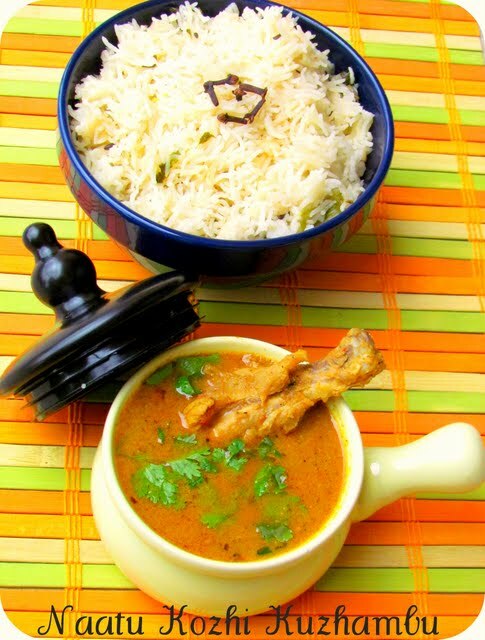 This step is very essential to get good quality adhirasam. Now slowly cook the syrup in medium flame ,checking the consistency of the syrup , every few minutes. We check the consistency, by dropping a drop of jaggery syrup on a plate of water. 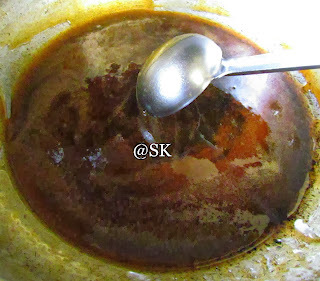 At first, the syrup will get dientergrated as I have marked 1 .After few minutes, the syrup will be thick ,but will not settle down properly without dissolving as in number 2.Third time, the syrup will be settling down, but it cannot be gathered together as in number 3. At last, the syrup will settle at the bottom ,without moving and dissolving. And we would be able to gather the syrup as a ball, as number 4. This is the perfect soft ball consistency. The syrup will be like this after reaching soft ball consistency. Turn off immediately and transfer the pan to the counter. 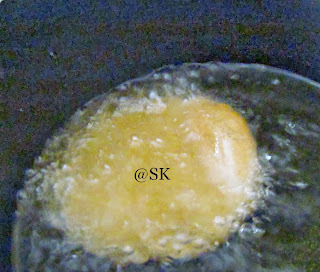 If not the hotness of the stove will make the syrup to pass through the soft ball consistency and will become hard. Add the dry ginger powder now and mix. Now ,we can either pour the syrup on top of the flour or drop the flour on top of the syrup. We should be very careful while doing this. I started dropping flour one ladle at a time. Immediately the syrup absorbs flour. I added all the flour as I got from 1 cup of rice. But I reserved 1 tbsp. of rice flour . The dough should be bit loose. Because ,after some time, it will become hard. So having loose dough will be very apt. Now transfer the dough to a container . We can also add some sesame oil on top of the dough, to keep it loose. Let the dough is at rest for 24 hours. Or atleast overnight.This way, the syrup absorbs the flour very well . Don't refrigerate the dough.Let it sit on the counter overnight. The next day, divide the dough into equal sized balls. 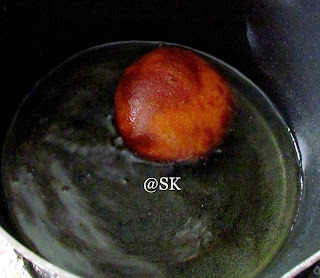 The balls should be bit big, as we are going to cook it thick adhirasam. Take a Ziploc or banana leaf. Grease your hands with ghee. 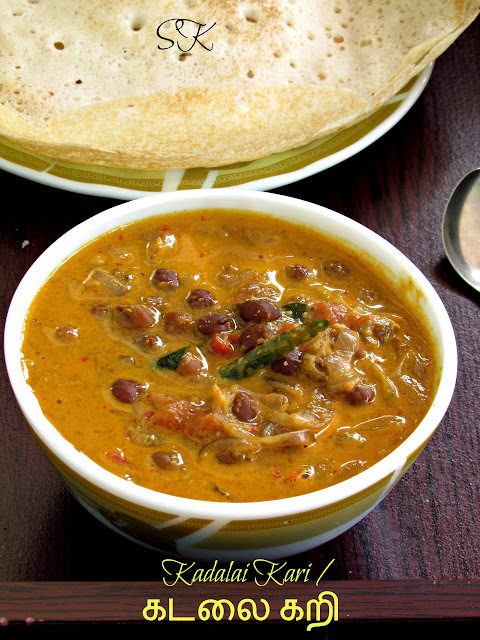 Pat the adhirasam ,slowly into a medium thicknessed ones. Don't pat it too thin, then the adhirasam will become crisp. Take a pan, add oil about 1 inch and bring it to hot. 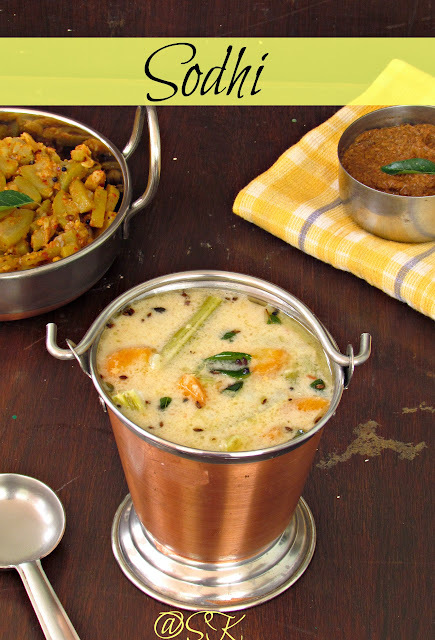 Then turn the stove to medium ,that is ,the adhirasam has to be cooked in medium flame throught. 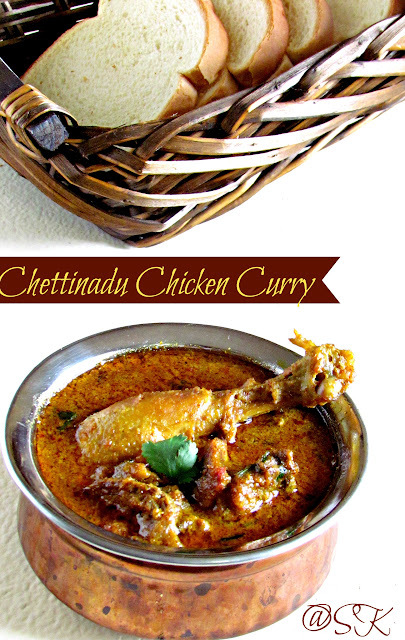 If not the adhirasam will not be cooked properly. To check the consistency, just drop a piece of the dough, it should come up after a second. If the dough comes out without disintergrating, then the dough consistency is right. 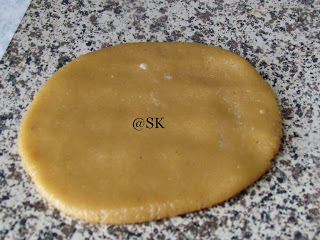 If the dough starts disintergrating, then add wheat flour , a tsp by tsp till it gets its shape. Some times ,the dough can become too hard, then we haveto add 1 or 2 tsp of warm milk to bring the dough to right consistency. 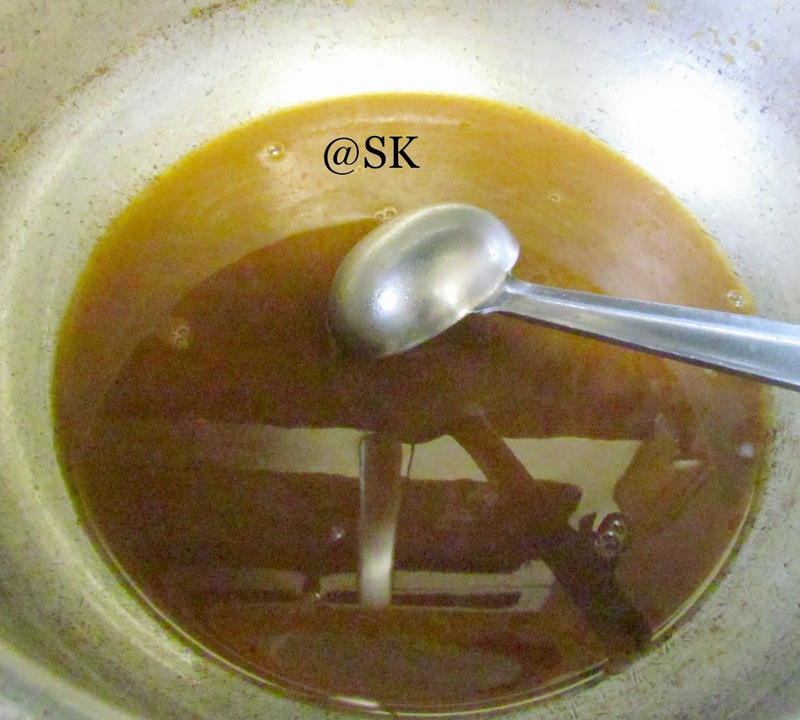 Now slowly drop the adhirasam in the oil. It will start cooking evenly in medium flame. While cooking, it will puff up like poori. A perfect adhirasam dough will puff like poori. It will be golden brown throughout. 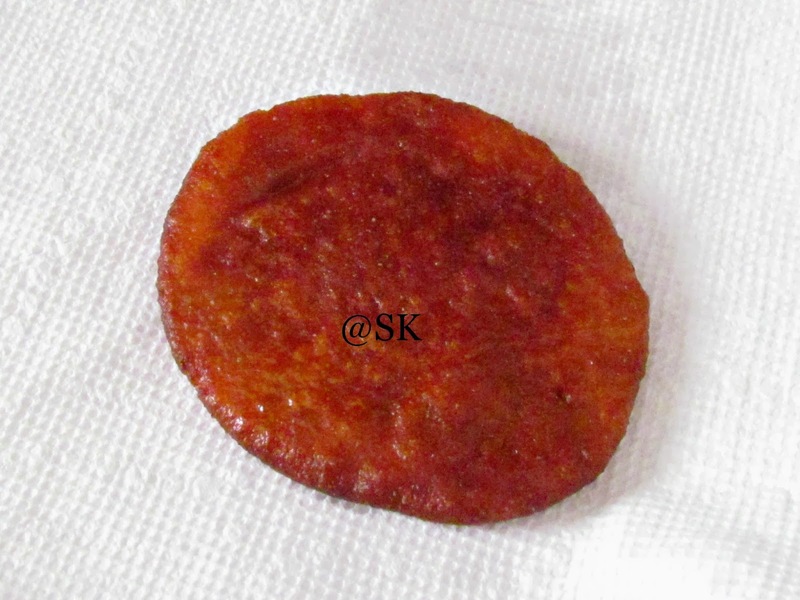 Don't cook the adhirasam for so long, then it will become crisp. 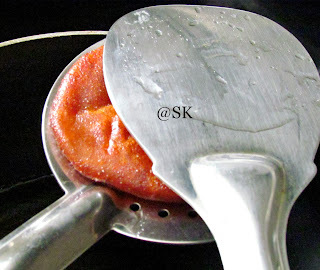 Strain the adhirasam using a ladle. Just balance the adhirasam on the pan ,using the ladle. 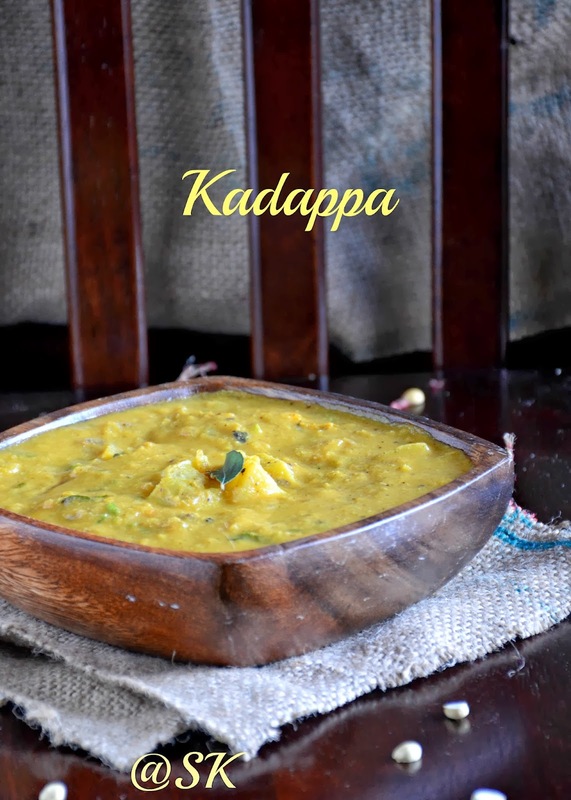 Using a dosa ladle, press the adhirasam, so that all the oil will be extracted and poured into the pan itself. 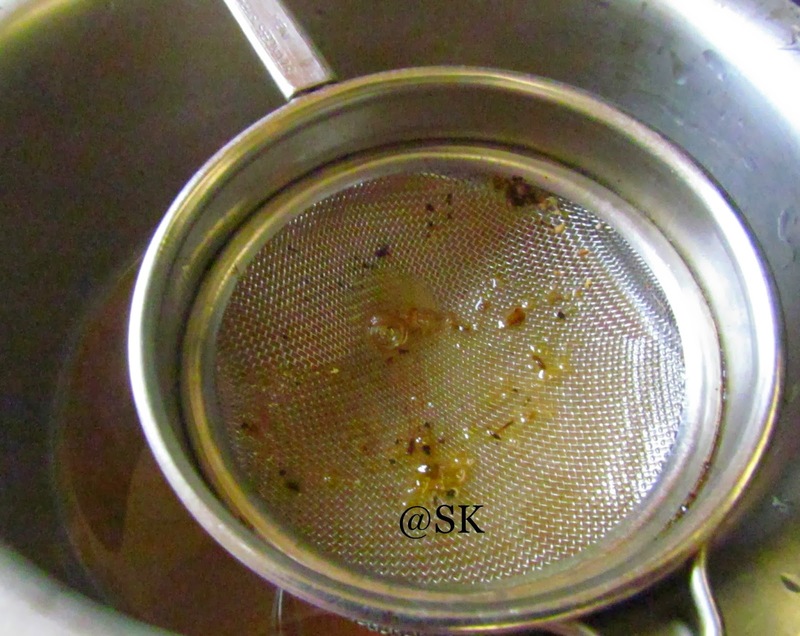 Strain the pressed adhirasam on a hand towel .Now it would have lost all the oil. 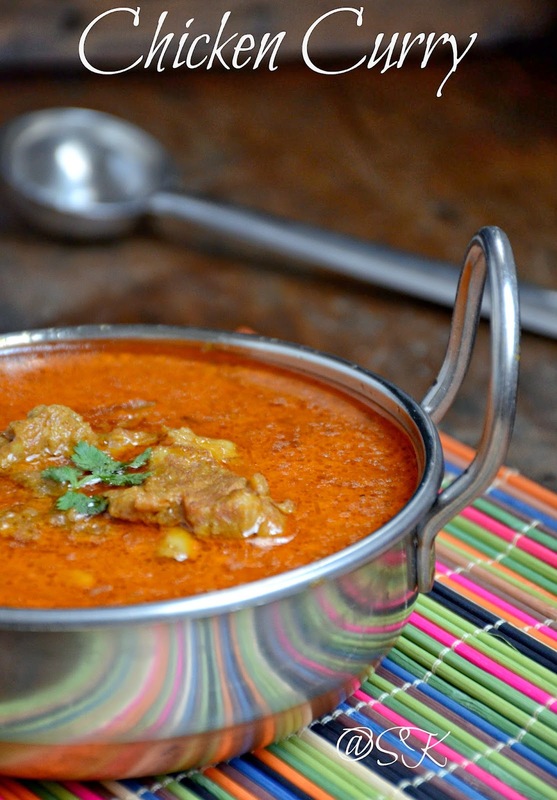 Cool the ahdirasam, completely and store in air tight container . * For preparing adhirasam, home made flour should be used. Store bought rice flour will not work. 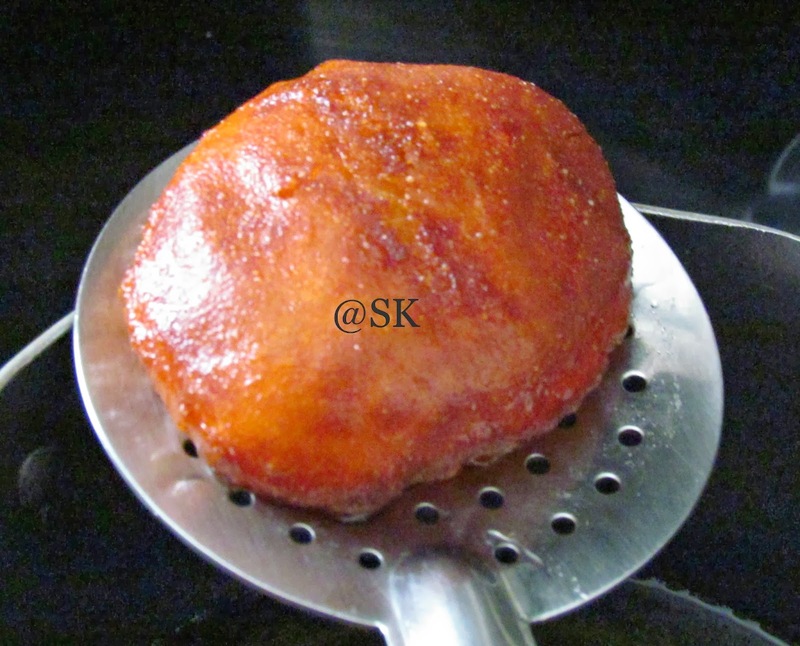 * The soft ball consistency for adhirasam is very important. 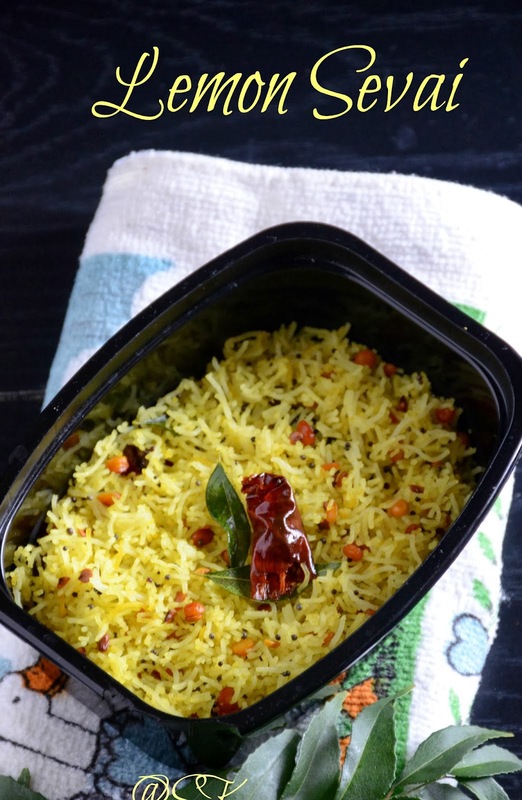 * Adhirasam has longer shelf life. * Using" paagu vellam" plays a vital role. * Resting the dough for atleast a day is very important. 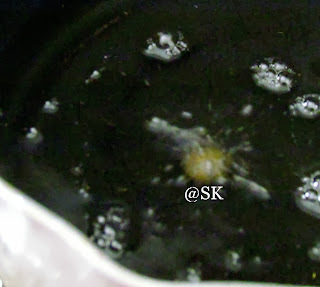 * Soaking the rice for 2 hours ,makes the rice flour smooth. 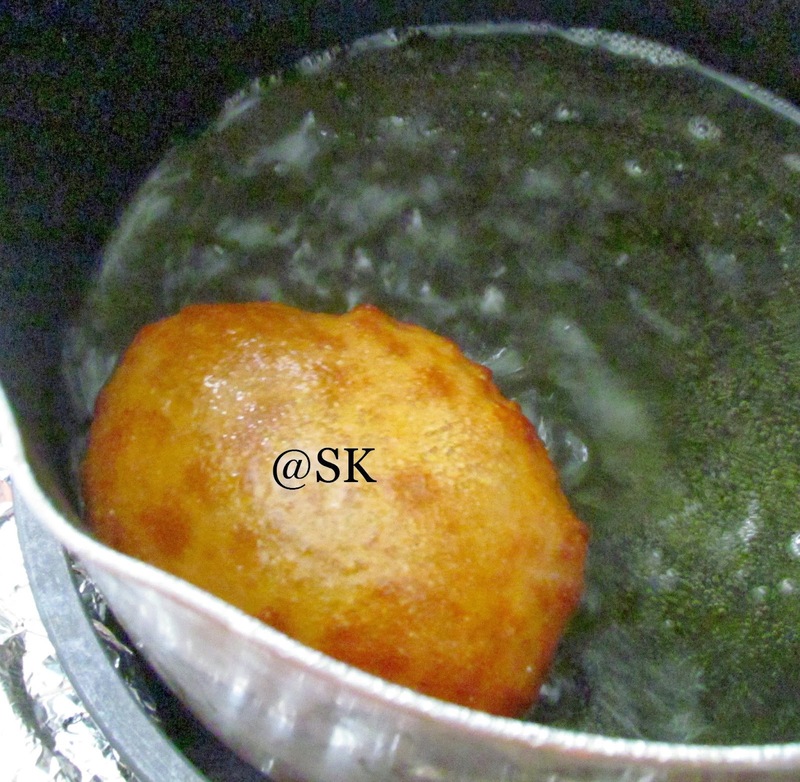 * Pouring oil over the dough, while resting helps it to retain moisture. 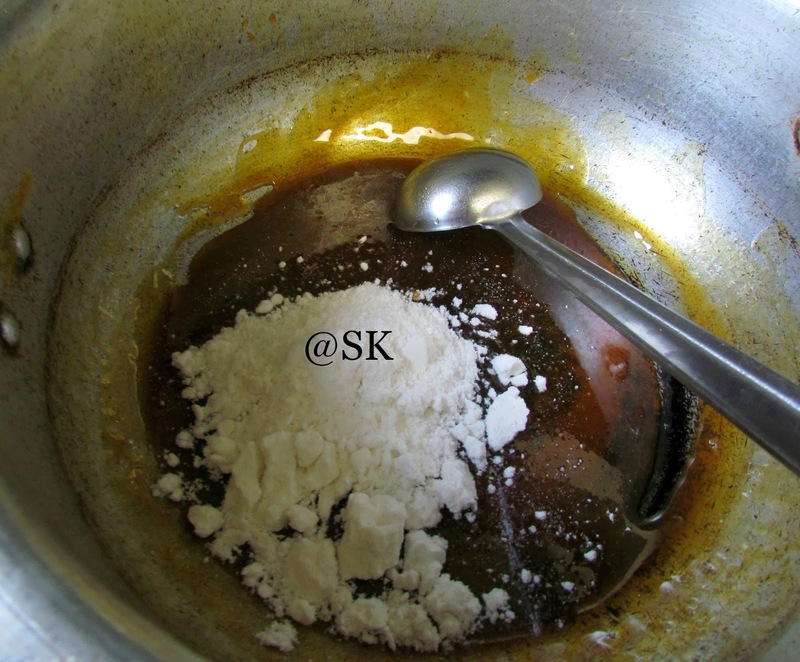 * Either pour the syrup on top of the flour or add flour on top of the syrup. 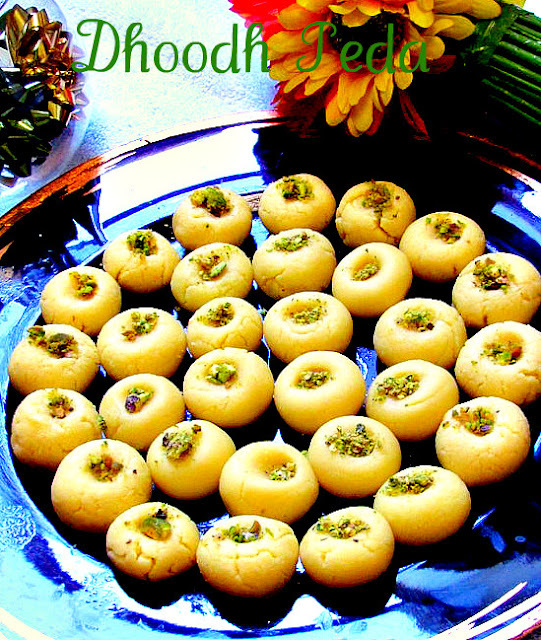 But make sure, the dough is loose, if not the adhirasam will become hard. 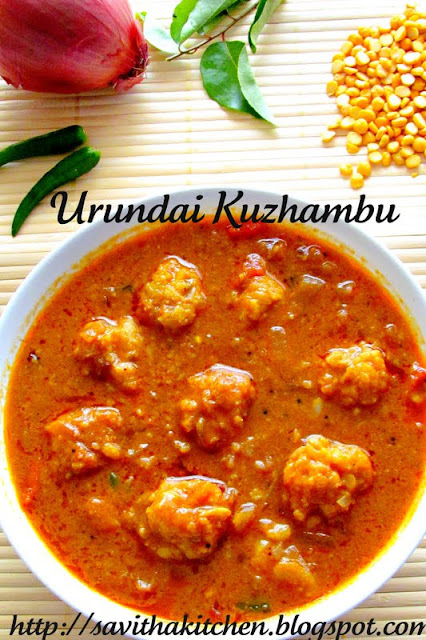 * We can prepare the dough 2 to 3 days ahead and prepare the adhirasam. But ,it may absorb more oil, while frying. 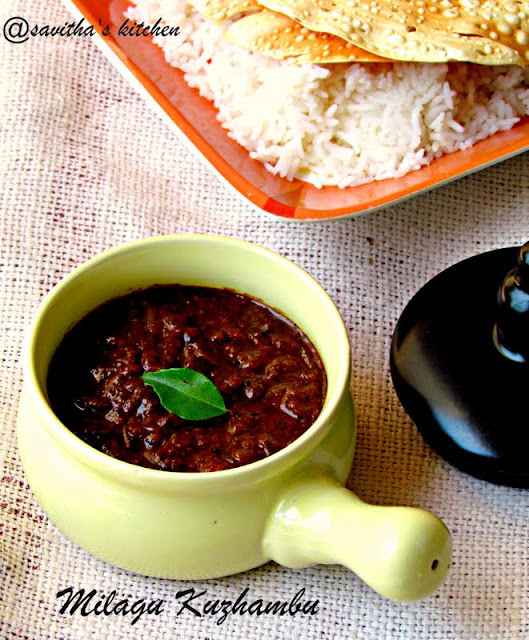 * Maavu arisi is very much essential, but it works good with raw rice/ ponni rice too. 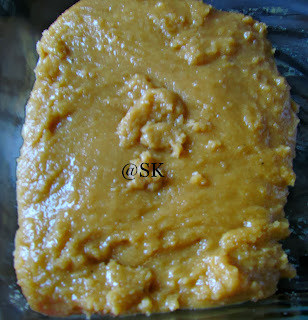 * If your dough is too tight, we can also make some more jaggery syrup of 1 string consistancy and add it to the dough. This will loosen the dough. 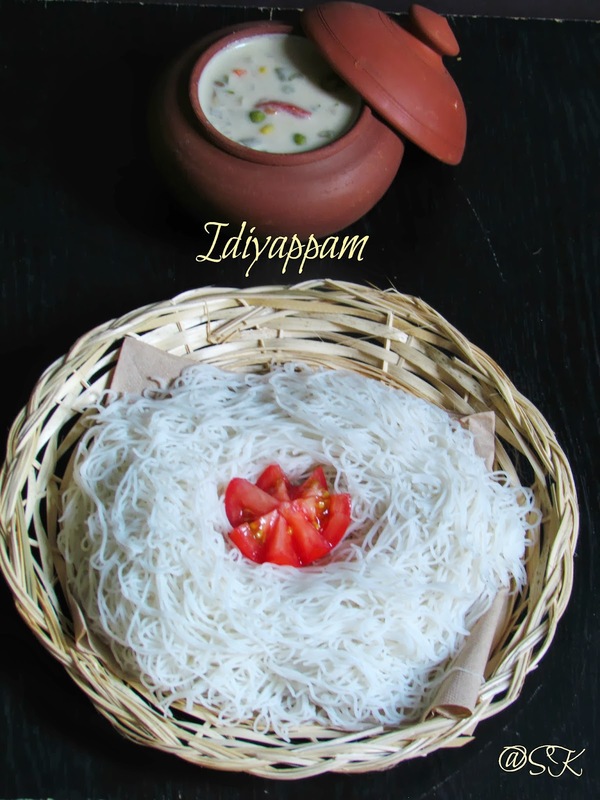 Tempting and yummy adhirasam .. 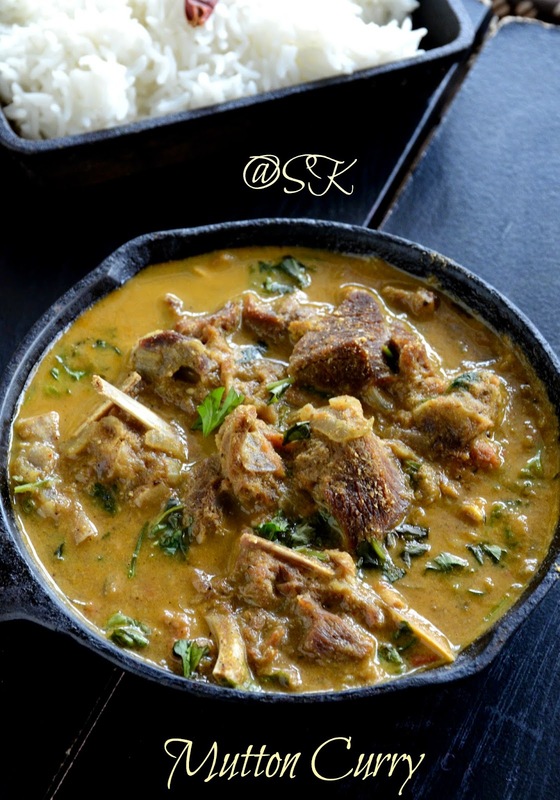 PErfectly made..
thanks for taking so much efforts to post a detailed recipe. Looks super yummy. U made them so well! Athirasam paarkkum pothu saappida aasaiyai irukku. So delicious food guide is this. Seems so yummy. Adhirasam posting super. more tempting.. Wow!!! Looks so sweet and yummy..
can Palm jaggery used for adhirasam? I don't think palm jaggery can be used for adhirasam. Nice recipe and well explained.I made the dough today and hoping that it will come out well tomorrow. 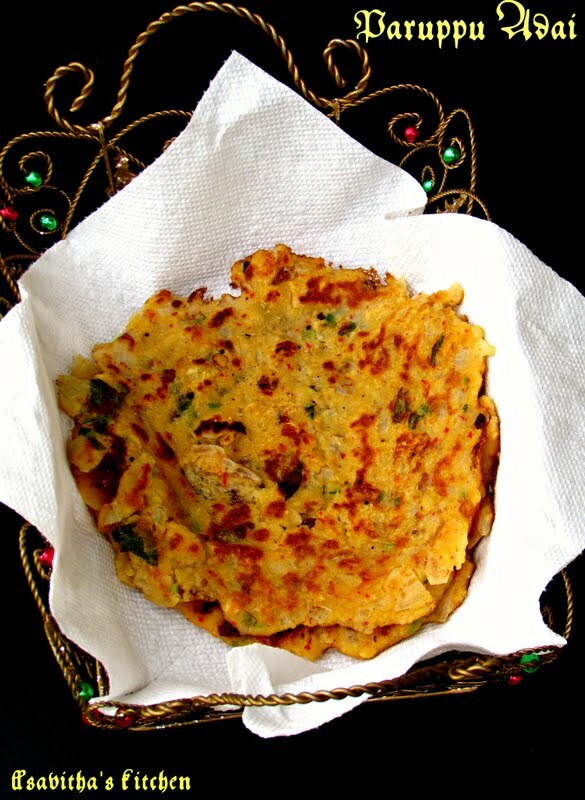 Can we add rice flour instead of wheat flour to prevent it from disintegrating. plz reply soon. The reason, I am askng to add wheat flour, is to bind the dough. If the dough disintergrates, the reason would have been the sugar syrup. So we can also try to add fresh and wet rice flour, not the store bought ones. But wheat flour will make it bind together. I tried this today. The dough became very loose. What can I do know? Have left the dough to set in an airtight container. I think the syrup is not right. If the syrup is right, it would have not disintergrated. All the best for the next time. Never give up. Lets hope that the dough will set next day. Or leave it for 2 days. If not add some fresh home made flour to it and see, what happens. 1.Should we refrigerate the dough for resting? 2. What's the water to jaggery ratio to make paagu and should we add water to make loose dough while mixing.
? 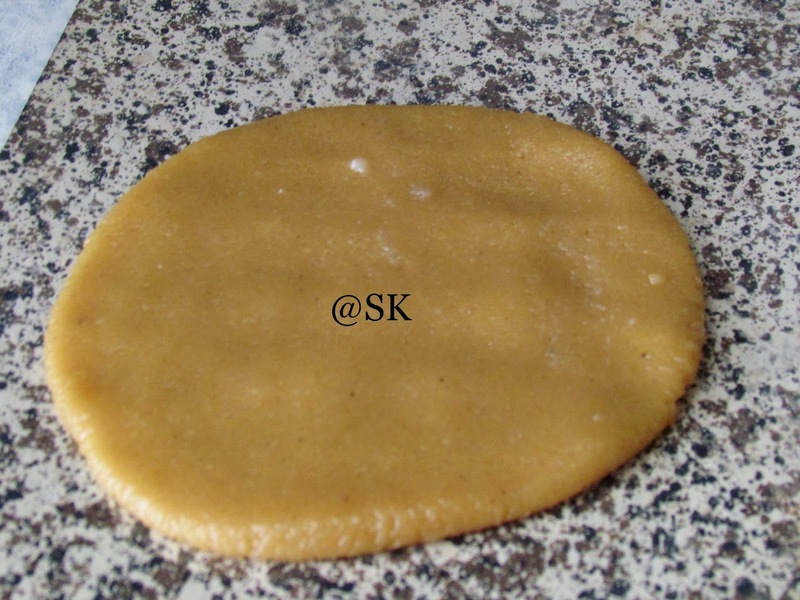 Please suggest solutions for layer y, soft round adhirasam. Help!!!! Pls reply immediately. 1.Don't refrigerate the dough. Let it sit in the counter overnight. 2. 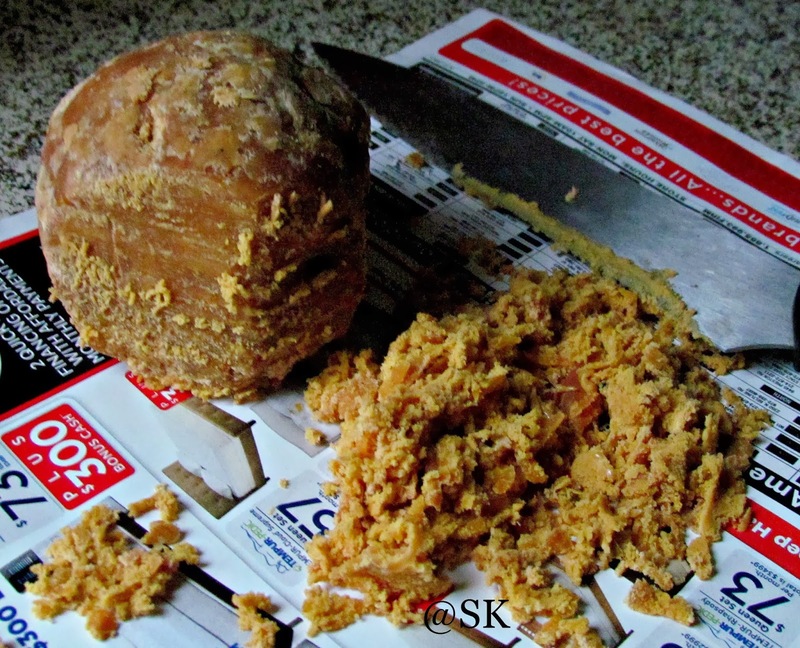 Add water, to just cover the jaggery.Don't add water to loosen the dough. Just sprinkle warm milk. I think, refrigeration, made the dough tight. All the best. Try again. Never ever give up. I have used achu vellam instead of paagu vellam. And the adhirasam gets disintegrated. Is there a possible way to correct it. Please reply soon!Awaiting your reply.